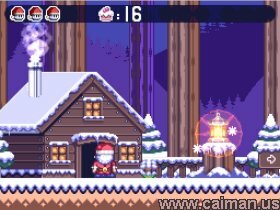 Caiman free games: Santaman and his Iced Muffins by Hayo van Reek (The Peasants). This game plays like your standard gridbased puzzle-platformer. You can walk around with the arrow keys, shoot fire-stars with ctrl, shoot ice-stars with the spacebar and jump with shift. (and of course you can configure that). You can also climb ladders and ropes, and crawl under stuff. 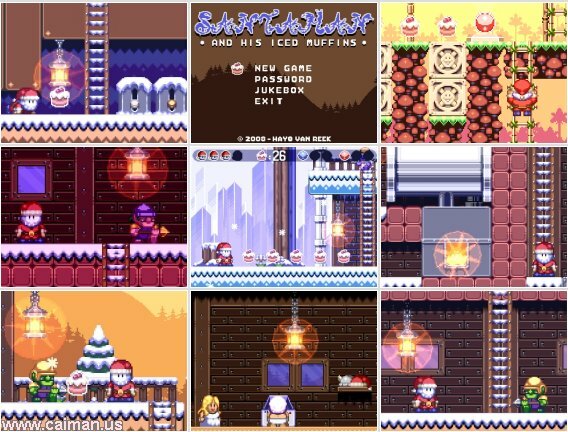 The main objective is to collect all iced muffins and get out. On your way you will find enemies, traps, blocks and bridges. Most enemies are easily evaded but you can also toast/freeze them with your (limited amount of) stars. I recommend freezing as you can play with the block of ice it creates, but don't let it play with you! 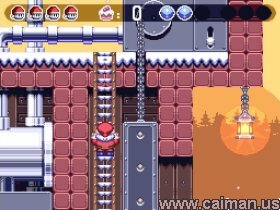 Every two levels you will find Santette (Santaman's lovely wife) who will save the game for you. Who stole Santaman's iced muffins? Whoever it was, he left a trail of spilled muffins behind on his way to his faul hideout. Fishhead 3 - Search for.